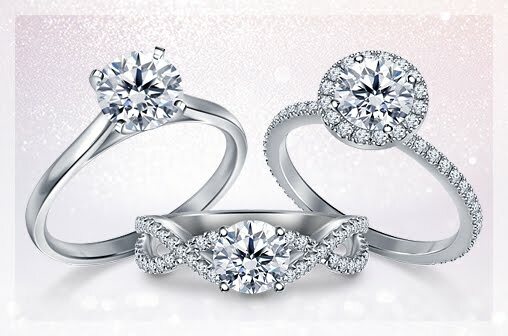 As we're celebrating the upcoming National Proposal Day, we thought about what has changed about engagement rings in the last couple of years. While there is no one definitive change, the rose gold engagement ring trend has certainly caught on in the last couple of years. 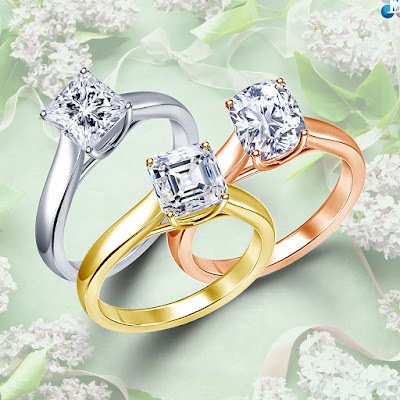 The warm toned metal has a romantic appeal that is perfect for engagement rings. Let's go back to the basics. Pure gold, which is yellow in color, is a very soft metal and would not be a good choice for jewelry. Unless it is combined with other metals to create alloys that are much stronger than the original metal. Copper and silver or zinc are some of the commonly used alloys. The proportion of gold to other metals is different in different alloys. This is where karat comes into play. Karat is the measurement of gold in an alloy. 24 Karat gold is all gold. 18 Karat gold is 75% gold and the rest is other metals while 14 Karat gold is a mix of 58.3% gold and the rest is made of other metals. Rose gold is made by combining gold (the natural yellow one) with copper and silver or zinc. The proportions of each metal depends on whether it is a 18K or 14K alloy. But, rose gold contains a significant portion of copper which gives it its characteristic "rosy" tint. The shade is a beautiful mix of the red tone of copper and the golden yellow color of pure gold. Rose gold first became popular in nineteenth century Russia. The 'blushing' pink shade also made it popular with Victorian Era brides. It continued to be popular through the 1940s and 1950s as there was a shortage of platinum. White gold became popular in the 90s which led to the decline of rose gold. It has become popular again with rose gold being used for electronics, fashion and home decor. Rose gold is definitely having a moment right now. The appeal of rose gold, of course, is in its warm hue. We think it gives an engagement ring (or any other jewelry) a vintage-like, romantic vibe. Especially, if it is combined with engraving and milgrain details. 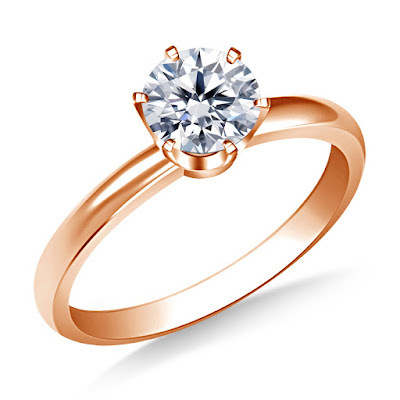 But, rose gold engagement rings with simple and classic designs such as solitaire rings or prong-set three stone rings also look lovely. The rosy tone that is its appeal may also be the disadvantage of rose gold. While yellow gold (and white gold in the last 20 years) has retained its popularity, rose gold fades in and out of fashion. 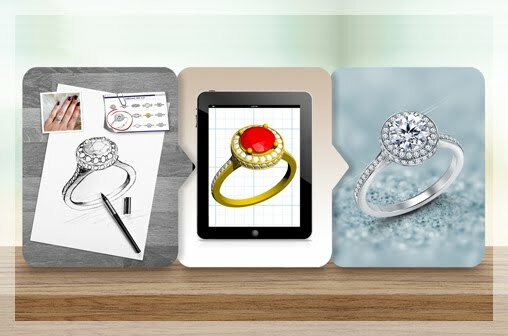 And an engagement ring design should be able to stand the test of time and changing fashions. But, we do think rose gold is here to stay. The copper tone is flattering on all skin tones and has a distinct economical advantage. 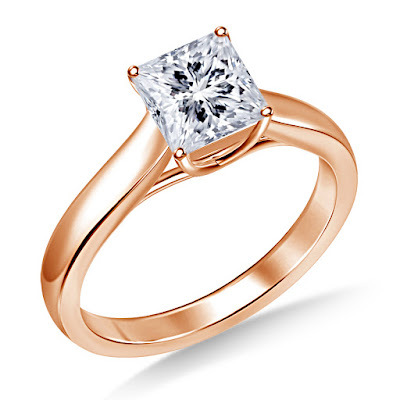 With a rose gold engagement ring, you can choose a center diamond that is lower on the color scale. Diamonds with color grades such as K, L and M have a bit of warmth in them as opposed to the icy whiteness of D, E and F. A rose gold ring with its warm tones would complement these warm diamonds very well. 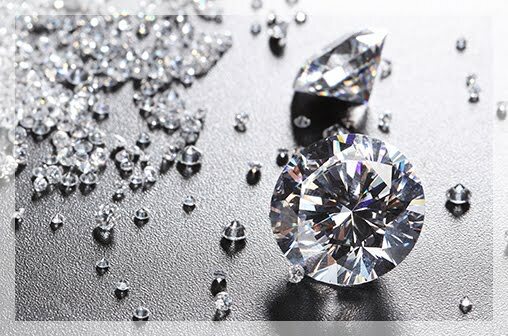 Diamonds with a lower color grade also cost significantly less than diamonds with a high color grade. 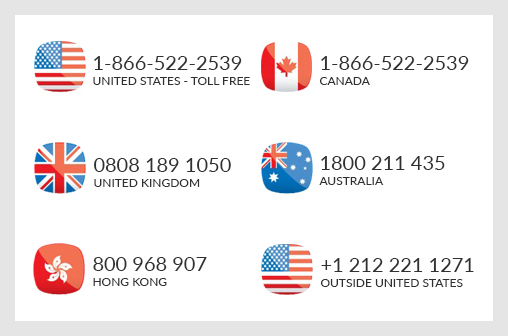 So, rose gold rings are a great choice for budget buyers or a smart buyer can trade off a lower color grade with a bigger carat weight. Want to see more? 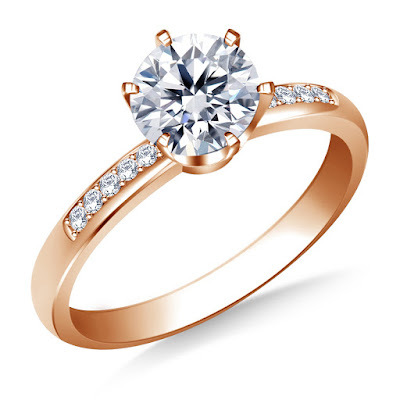 Here are some absolutely stunning rose gold engagement ring setting in our collection. 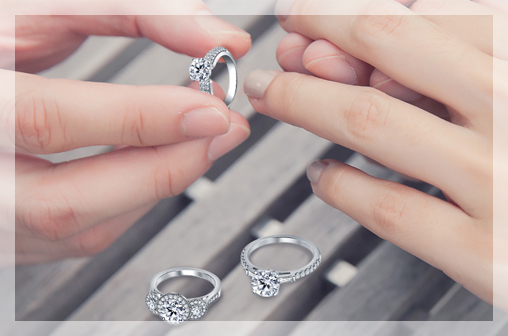 The classic six prong solitaire is a good choice. Or choose one with a bit of sparkle like this rose gold engagement ring with pave side diamonds. If your center diamond has a square profile like a cushion, princess and asscher, choose our Trellis style solitaire rose gold ring.